Tiger Woods hits a shot during a practice round Tuesday as he prepares for the 2012 Masters Tournament. Augusta, Georgia — From grandma to grandson, from fan to foe, the throngs at Augusta are happy Tiger Woods is back in form and ready to contend for a fifth Masters title. Like Arnold Palmer had his army, Tiger certainly has his troop. Thousands of patrons lined the fairways on Augusta National Golf Club’s front nine Tuesday morning as Woods played a practice round. They crammed themselves as many as 10 deep around the greens and moved from tee to green like waves going up each side of the fairways. As he spoke, his son Zeke, 6, tugged at his father’s pant leg, begging to go to the practice tee to wait in line for Woods’ autograph. “He’s very special,” Zeke squeaked about his favorite golf star. Woods scored his first official PGA Tour victory in two and a half years two weeks ago, winning the Arnold Palmer Invitational at Bay Hill in Florida by five strokes. It was also his first victory since disclosure of his marital infidelities, which led to divorce. In the months between those wins, his game nosedived and he plummeted from the top spot in the world golf rankings, even falling out of the top 50. He’s rebounded to No. 7 and rebounded with the fans, too. Leo Brown, a 60-year-old from Greenville, South Carolina, was pleased to see Woods back in the winner’s column. “He showed all the doubters that he still had a game,” Brown said. Some never were doubters, including Qabaniso Lupafya, a native of Zimbabwe who moved to Massachusetts 26 years ago and now lives in Worcester. Tiger Woods smiles during Tuesday’s practice round. “I love Tiger. I’m obsessed with him,” said Lupafya, who also goes by Frank for those who can’t pronounce his name. He said his goal is to play with Woods one day. Lupafya, a former rugby player, said watching Woods — and a nasty knee injury — inspired him to take up golf four years ago. He’s down to a six handicap, he said, and has won local tournaments, but he’ll just be watching Woods from the other side of the ropes at Augusta. “I got a date with Tiger. I’ll see ya!” he said Tuesday morning, scampering down the ninth fairway in search of his idol. Gary Hanson of Palm Beach, Florida, also had a date with Tiger on Tuesday morning, but don’t count him among Woods’ fans. That’s because Woods doesn’t respect the fans, he said, adding the golf star had done little to acknowledge their cheers in Tuesday morning’s practice round. “Without the fans, where are you?” Hanson asked. So why was he making the trek around Augusta’s back nine for a meaningless round on a gray Tuesday morning? For himself, Hanson said, he’d rather be following Phil Mickelson. “And you know why? Because he interacts with the fans,” Hanson said. Don’t tell the kids Woods doesn’t interact. It was only a practice round, but a crowd gathered to watch Woods. Up by the practice green, they squeezed against the railings of the junior autograph area, hoping to get Woods to sign whatever they had handy. Alec Cwienkala, a 13-year-old from Allentown, Pennsylvania, scored Woods’s signature on his flag. “It was really cool being up close to him,” said Alec, who waited 90 minutes in the autograph area. Woods and the other Masters participants have been examples for his own game, Alec said. “I try to make my swing like all those pros,” the young golfer said. And maybe watching Woods is something that will inspire new generations of players to take the game to new levels. Vicki Martin of St. Cloud, Minnesota, said she thinks there’s something to that argument. “Tiger makes these young kids what they are today,” said Martin, noting that Woods athleticism and conditioning regimen has set the standard for others and elevated the game as a whole. Martin said Woods has inspired her 13-year-old grandson. 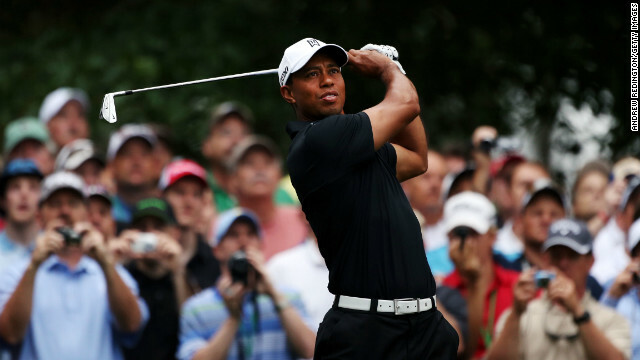 Woods has elevated more than just the sport, said Jim Banks, a retired Army colonel from Fort Hood, Texas. That’s because if Woods is bringing people out to PGA Tour events, the charities that golf supports are able to do more for those they serve. Out along Washington Road, the main route from Interstate 20 to the course, Woods’ resurgence is having another kind of economic effect. Those who came to Augusta without tickets are paying more to buy passes from the roadside brokers. Tye Bedwell of Chattanooga, Tennessee, his brother and a friend lucked into two passes at face value from a passing motorist, Bedwell said. But they still needed a third and hadn’t found anything under $350 at noon Tuesday. “We’re not going to pay $350,” he said. “The ticket price has spiked up,” said Randall Matod, who said he’s been trading tickets on Washington Avenue for the past 30 years. He had sold passes for Tuesday’s practice round for $250, he said, but was looking for new inventory at lunchtime. For Sunday’s final round, they’ll be around $500 — and they’d be higher, he said, but the fact that Sunday is Easter is keeping the price dampened a bit. Of course, that Easter Sunday deduction may well be eliminated if Woods is atop the leaderboard on Saturday night. “I couldn’t say I’m pulling for him to win. It just makes golf more interesting,” said Jordan Myers of Columbia, South Carolina, who was watching for Woods with his brother and father. “Golf is way better with Tiger,” said Alec’s father, Steve Cwienkala. “Whether you love him or hate him, the sport needs him.